The Fab Lab located at the Upper School is open to students, faculty and community members in every division. Designed to be a collaborative, hands-on space where students can plan, develop and test ideas, interests, and inventions, the Fab Lab opened in 2016 and includes 3D printers, laser cutters, large and small CNC milling machines, a vinyl cutter, an electronics bench, 2D and 3-D design software, and other digital and analog tools. Through the Design and Engineering course taught in the Fab Lab and modeled after the rapid-prototyping FABLAB at the MIT’s Center for Bits and Atoms, students explore digital fabrication, design and prototyping. Exploring a variety of design elements through mixed media, materials, computer assisted design (CAD) software, machines and digital programming, students learn to create through an iterative design and engineering process. “Fab Play” crosses all grade levels at Hawken. Because play is such an important part of growth and development, “making” projects that involve playing, tinkering, designing and creating begin at a young age. 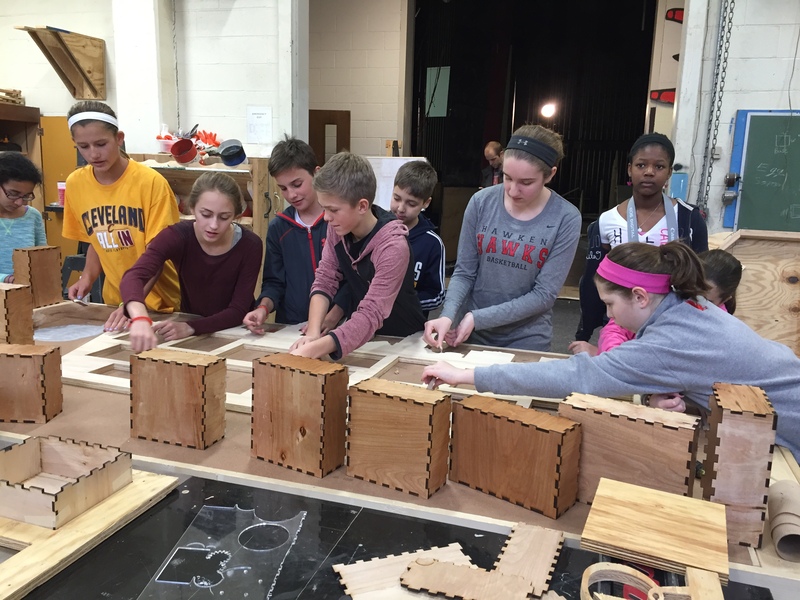 Students from the Lyndhurst campus have traveled to Gates Mills to utilize the maker spaces for special projects, and our Director of Maker Spaces Nick DiGiorgio has taken portable equipment on the road to share with students in our lower and middle divisions.